ProMark will be closed on Thursday November 27th and Friday November 28th in observance of the Thanksgiving holiday. We would like to wish all of our customers, employees and vendors and their families a Happy Thanksgiving! ProMark is thankful for your help and support. Line Markers are above ground, high-visibility signs that identify the approximate location of buried pipelines. Most pipelines are buried underground. Line Markers indicate the type of pipeline buried such as; Gas, Natural Gas, High Pressure Pipelines, etc…. and also includes the name and contact information of the company that operates the pipeline. The main purpose of Line Markers is to alert those who are digging or working in the vicinity of the pipeline and prevent damage. 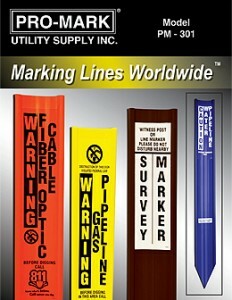 ProMark is a leading manufacturer of Line Markers. Our Flexible Utility Marker (Model# PM-301) is an ultra-high weather resistant Line Marker with exceptional durability in UV, moister, heat and cold harsh conditions. 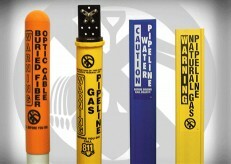 Ultra-Violet resistant decals are applied to these Line Markers indicate company and contact information for the specific pipeline being identified. For more information on this product please see our Flexible Utility Marker product page. ProMark also manufactures a Dome Marker Post (Model# PM-303). This Line Marker is molded from specially formulated, virgin prime resins with UV inhibitors. Its 360˚ cylinder shape and height insures that the Marker can be seen from all angles on the ground and by air patrols. Pipeline graphics and information are etched into the Dome Marker Post with a graphic system guaranteed for life not to fade, peel or chip. The Dome Marker Post is one of the most durable Line Markers being manufactured today. For more information on this product please see our Dome Marker Post product page.